Front armor of the Ferdinand, mobility of a Jagdpanther, the firepower of a T110E5; this pack isn’t the french Tier9 TD yet, it’s just the AMX AC Mle. 1948. The AMX 50 TD has all of these and then some. The Foch is the final evolution step started with swarms of little “frogs” in low tiers, and it is arguably the most powerful vehicle in the game. However, the best part is, that it earned a catchy nickname fast. 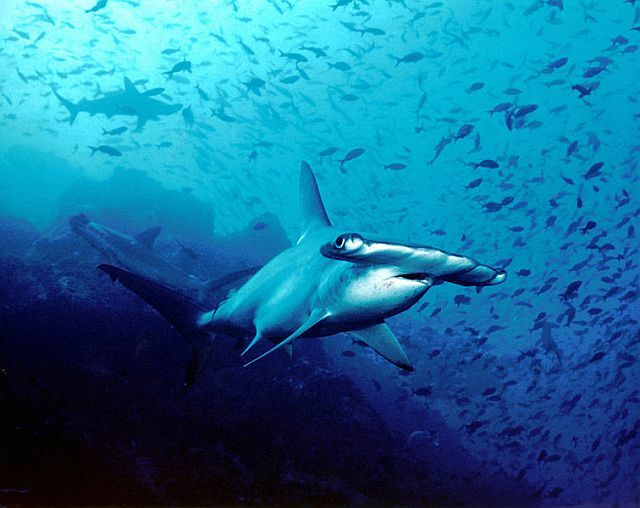 We call it the hammerhead shark. But why is that so? Well, just take a look at it from above. WoT Armory has made a brief test about the AMX 50 Foch. 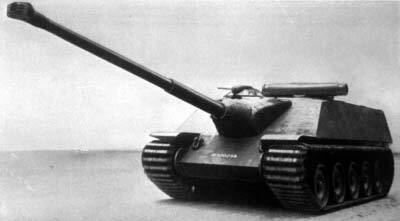 The French had flirted with the german-like turretless tank destroyer concept after the war. 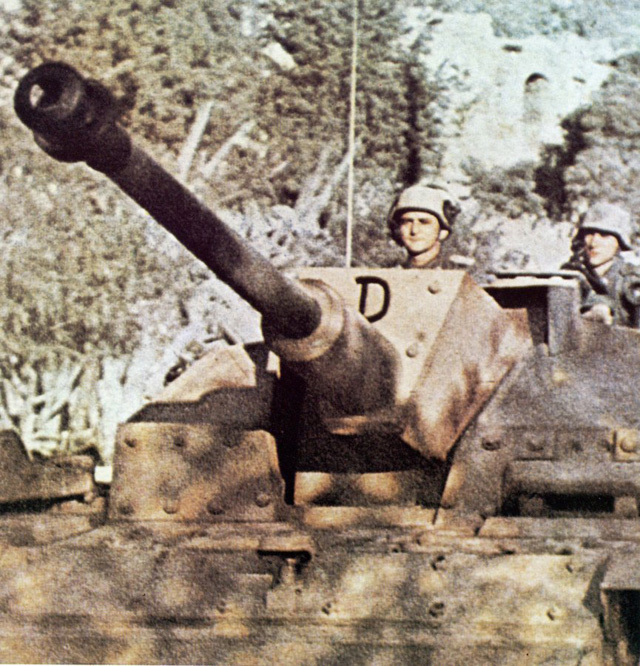 The original german TD was basically a mobile artillery piece, a fully enclosed and armored assault gun for supporting the infantry, the “Sturmgeschütz”. The Stug did a great job at holding the russian tanks at bay in Russia, so the designers took one step further. They sacrificed the rotating turret on obsolescent and brand new panzer chassis alike for a bigger gun and a better armored superstructure. Turretless tank destroyers were cheaper and easier to manufacture than tanks, and Germany was forced to be on defensive anyway. Jagdpanzers worked well from ambush positions, in the second line of an armored assault, or on the flanks, covering the turreted armor. Unlike previous blueprint only TDs like the Mle. 1948, several AMX 50 TDs were built, the first in 1950. The Foch never reached mass production, because designers managed to mount the same 120 mm gun on the AMX 50 tank, and the TD-design became a surplus. The story would had ended here, but Word of Tanks had resurrected this armored monster, and the Foch entered the virtual battlefield in the 7.4 patch. Lady Luck was at our side. Despite some unexpected difficulties, we have managed to test out two new french tank destroyers. But this post will be shorter than usual. These vehicles are very new, and I don’t want to pretend, that we know everything about them in such short notice. The tests were brief, but the front armor schemes are more or less completed. 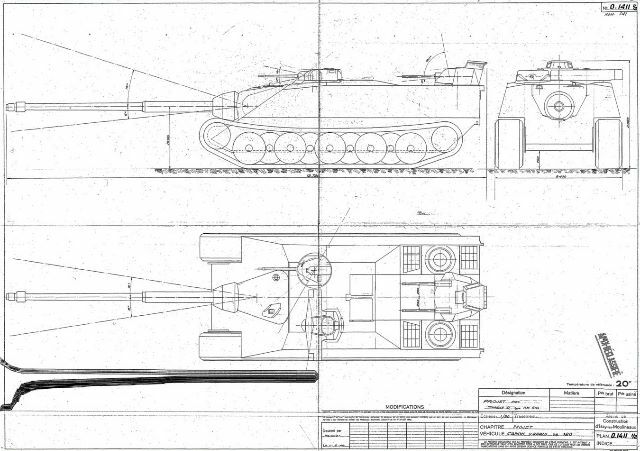 First, let’s take a look at the Tier8 tank destroyer, the AMX AC Mle. 1948, our first frenchie at the same time. France finished the war at the side of the victors, but the years of german occupation had been lost. To stay among the major powers, the country had to take a huge leap in military technology. After the Second World War, the forced marriage of the french ingenuity and german technology gave birth to many strange creatures in the armored fighting vehicle world. This mixture of technology, like the then ultramodern oscillating turrets with revolver guns and german type suspension with overlapped road wheels proved to be a dead end. In the 50s, these technological venturesome but unbalanced designs flourished both on drawing boards and test ranges. In the end, the medium ranks were filled by solid, imported tanks from the US. Domestic, conventional designs took over in the 60s. 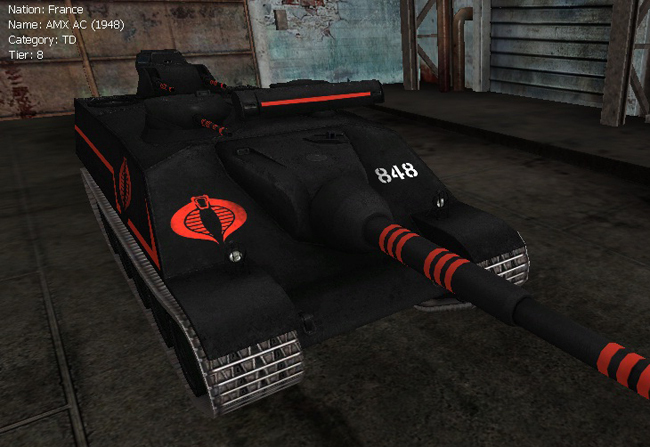 However, abandoned prototypes were given a new life in the virtual space of World of Tanks. For me, these new french tank destroyers look futuristic. Maybe I am just very into the 80s, but the Mle. 1948 somehow reminds me a multirole Cobra tank from the G.I. Joe cartoon. A sleek, modern-looking design with multiple turrets. The more I look at it, the more I expect the backdoors to open in any minute, and viper troopers rush out, battle cries echoing. 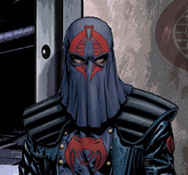 I can barely wait for a stylish tank skin with the Cobra-insignia on it. Hold that thought, it’s done! Shut up WG and take my money! Give a slab of steel to a russian engineer, it doesn’t matter, what he makes from it, the product will look like a tank. But what a great-looking one! I mean, no one really doubts, that in this game with such oriental roots, all members of the KV- and IS-family will be present sooner or later. The less-known IS-6 arrives in patch 7.4 as a Tier8 premium heavy tank, but from what we have seen on the test server, I seriously doubt, that it will be a hit as a money-maker. 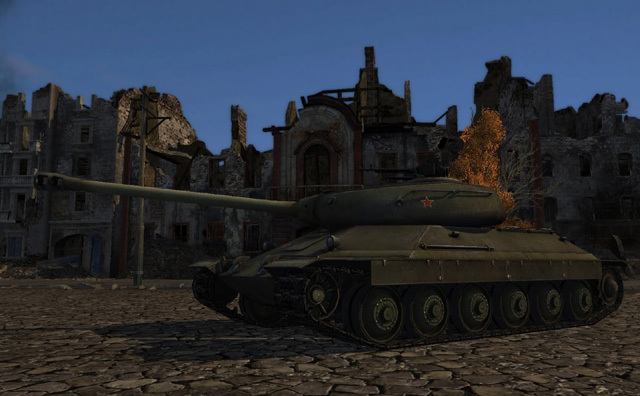 WoT Armory makes its case about the IS-6 premium heavy tank. First, they want to make ingame currency for the upkeep of their higher tier tanks. The turning point of self-sustainability lies somewhere around Tier7, some tanks can collect the silver for the next, higher-level vehicle, others can’t. From to patch to patch WG tries to squeeze out more and more real-life currency by open or secret nerfing of credit multipliers, by rolling back cheap farming strategies like HE-nerf for mid-tier tanks with howitzers below 15cm calibre, and so on. And hey presto, the Type is back in a time-limited sale pack. These days, if someone asks for a cheap and effective farm tank, my humble answer is the Stug, still. But the time of my personal arch-moneymakers – the M4A3E2 and E8 – is over. They still gain silver, but too much effort in a forever screwed matchmaking, to little income. The company does not want to feel yourself good in mid-tiers. All right, less monologue, more content. The other factor of a personal premium tank strategy is the crew-training (that won’t work with chinese, obviously). We can use any tank crew from the same nation and vehicle class in a premium tank, without retraining and lose of efficiency. In short, we can make silver and level the crew of our elite tank crews at once. Even if we make only the daily doubles, that is four times the experience for a single crew, and with the arrival of the 7.2 skills and perks no amount of experience is enough anymore. Well played, Wargaming. These are the two criteria of a premium tank. Buying is a strategic choice. 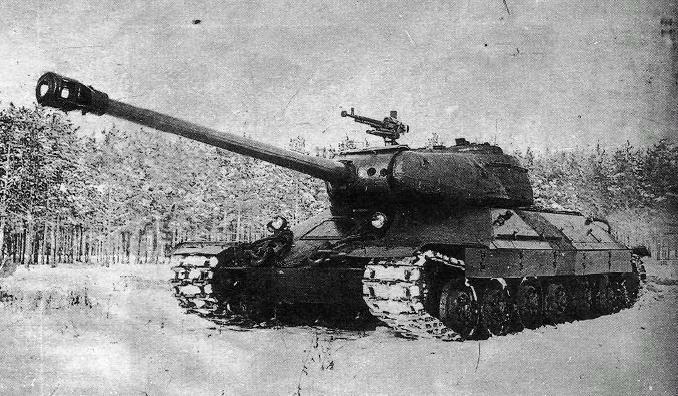 If we ride a IS-7 in Clan Wars, and we want to solve our credit-problems and want to accelerate the skill-earning at once, the IS-6 might be a solution. The tank itself is perfectly good-looking, the cool factor will boost the sales among younger players, but a long series of BUTs starts here. if we look through the factors, they are making a premium tank good, we can see, that the IS-6 just does not cut it.